Yay taxes!!! OK, that's a bit of an overstatement. But, if you're like us and overpaid your taxes throughout last year, getting a refund from the government is a great second prize, right? This year our refund totaled $1,982.76. Our monthly budget has been very tight the past year (read a little more about that here), so this was a nice sum of money that we could deploy into our budget to help alleviate some categories. When we come across extra money such as a tax refund, we usually take the approach of looking for ways to free up as many dollars as we can in our monthly budget (except for last year when Kelsey convinced me to spend half our refund on an IKEA couch for our basement...which is actually super comfortable and we use it nearly every day). If we were going to use these dollars to fund certain categories, what categories would provide the greatest monthly benefit for us? At the beginning of the year we had our annual Williams Family Meeting, and we realized we needed to start putting money aside for our yearly trip to Okoboji, as well as save up for the kids' birthday parties (March and June). The monthly savings for those two items was $117, and the total amount we had left to fund when we got our return was $443. We didn't start saving for the birthdays early enough. I know, I know... they happen every year and shouldn't be a surprise. We're not always great at setting money aside in the months after the birthday parties (July - December) because there are always other things to save for. So, we hope to do better this year and spread those costs out over the rest of 2016 for next year. We already do this year-round for gifts for others and Christmas (it hurts less to save a little every month). 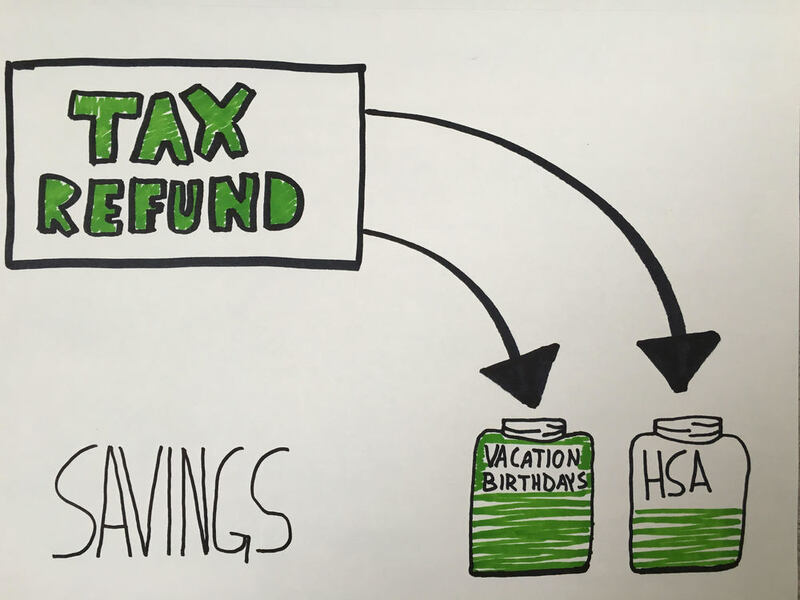 After funding the vacation and birthday parties, we had quite a bit left, so we deposited it into our HSA. We can max out the HSA with $6,750 this year (or $562.50 per month). So, based on what we had already added to the HSA and after adding in the rest of our tax refund, we now only need to save $458.40 per month for the rest of the year. So, basically, deploying that $1,900 tax refund to a few different goals helped us get back $221.10 per month in our budget ($117 from the birthdays and trip to Okoboji and $104.10 for the HSA). And we have the peace of mind that our trip is already saved for! The important thing to remember is to be intentional with your refund if you do get one, and if you had to pay in or got an enormous refund this year, talk with your tax professional about what you should change in 2016 to avoid the same situation this year.